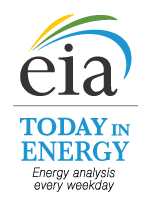 EIA's Today In Energy stories at your fingertips! Want to publish our analysis and graphic (chart, map, diagram) on your website as soon as we post it every weekday? It's easy to put one of our widgets on your website. Pick the widget that suits your space, grab the embed code, and copy it into your page. Or would you rather promote Today in Energy on your site with a banner or badge? We've created banners and badges in a variety of sizes and colors. Help yourself to the code at the bottom of this page. 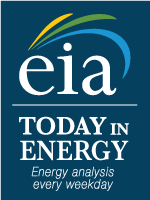 These Today in Energy widgets are online applications built to be displayed on other websites. You can embed these widgets in personalized home pages, blogs, and other sites. Once you've added the widget, there's no technical maintenance - the original source of the information will update the content automatically. Copy the code below the badge or banner you would like to put on your site.